Since I won my ticket to Alt Summit so late all the Tuesday night sponsor dinners were already full. I was kind of bummed about that and emailed the organizers asking if I could grab any spots that opened up and they responded that they'd find room for me somewhere. I started on my Hatch-inspired dress thinking it would work for whatever dinner I ended up going to. Then I got an email telling me I got into the Bing dinner (which was amazing, by the way) and that the theme was "Colorful Awesome." I looked at my gray dress. My gray dress looked at me. We both shook our heads and I went back to the drawing board. A trip to JoAnn's yielded a fabulous thick turquoise knit and I knew I was in business. When I got home I used my tee and skirt to make my pattern. This works best if you turn them inside out and really take the time to smooth out bumps and any wonky areas. I used pink butcher paper left over from a baby shower and a marker I filched from my kids. Because I'm classy like that. Trace a front, back and sleeve pattern (I had to get a bit creative with tucking bits of shirt in to get a proper sleeve piece) and cut out. And, because I am the world's most absent-minded seamstress, I like to label what each piece is and mark where the fold is. Your pattern pieces should look something like this. You don't really need a pattern piece for the binding but just keep in mind that you'll be needing enough fabric for one! Pre-wash and dry your fabric. 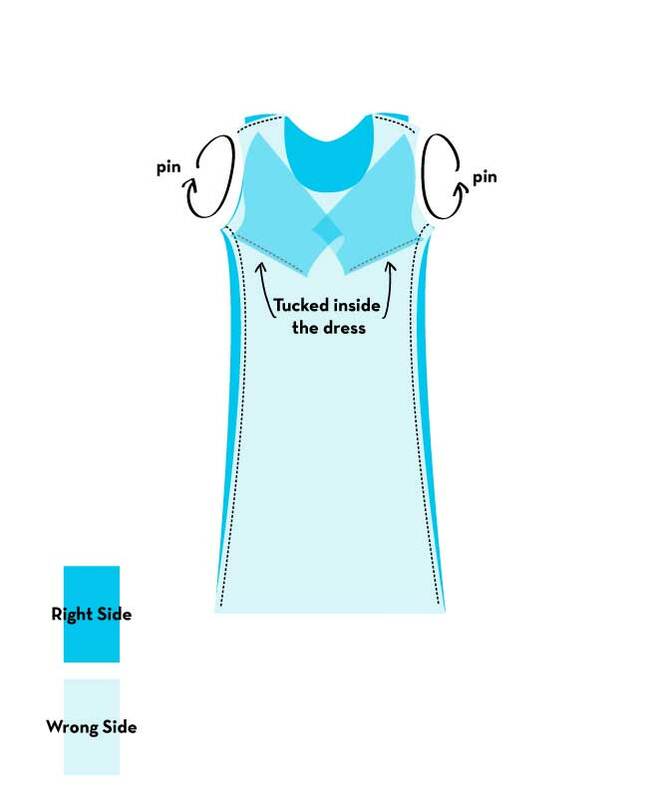 Place your pattern pieces on folds (making sure the stretch is going across the dress, not up and down. 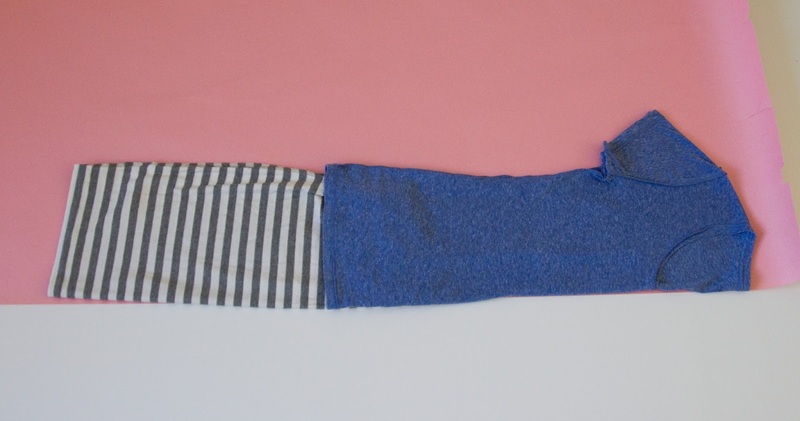 Especially if you're needing to squeeze a belly into this creation of yours) and cut out one front, one back, two sleeves and one 1.5-2 inch wide strip that's long enough to go around the whole neckline. Excuse my mediocre drawing abilities, but imagine laying your fabric flat then taking each side and folding it in toward the middle so you've got folds on both the right and the left. That's what's going on here. I don't own a serger or anything fancy so I assembled the whole thing using a basic zig zag stitch. It's fast and it works like a charm with knits! My fabric didn't have a wrong or right side, which made things even easier, but to assemble the dress take the front and back pieces and put them together with right sides facing. Sew the shoulder seams and side seams (I like a 1/2 inch seam allowance). 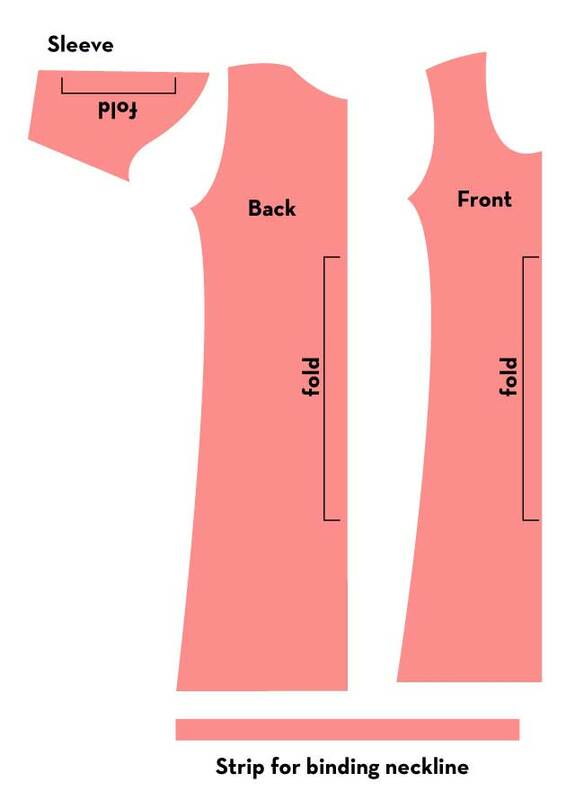 Take your sleeve pieces and turn each so that they're folded in half at the shoulder with right sides together. Sew under the arm then turn right side out. This is where a diagram is handy because explaining it is a bit hard. 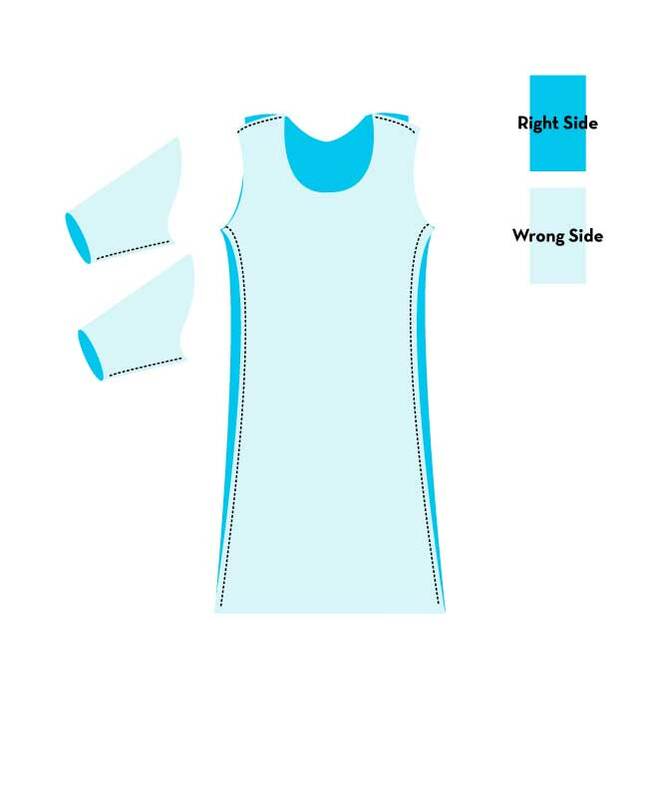 With the body of the dress inside out and your sleeve right side out, stick the sleeve inside the dress, lining up the sleeve edges with the sleeve hole. Sometimes it helps to think of it in terms of a finished garment- if I turned my dress inside out and tucked the sleeve inside, how would that look? That's what you're going for. Take your time pinning, matching edges, and making sure the sleeve fits into the socket properly (mine magically did but it doesn't always happen that way. 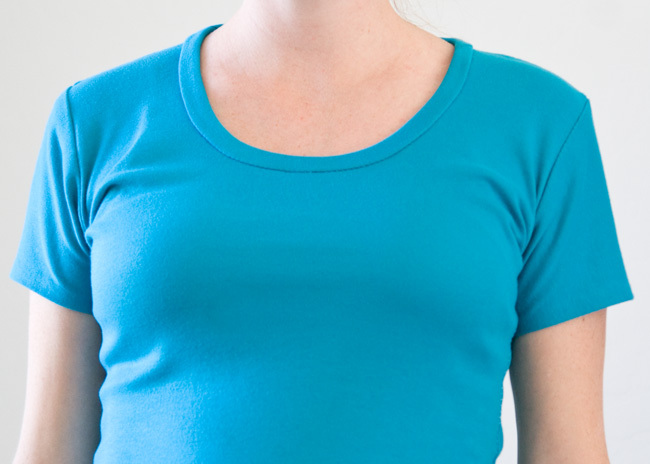 Sometimes I have to make adjustments- rip out a few seams in the arm pit or stitch in just a bit to make it smaller). Then carefully sew around your arm hole. I go very slowly when I'm doing sleeves- screw-ups on your shoulder are hard to miss! Now all you've got are finishing touches! Take your 1.5-2 inch (depending on how wide you want your binding) strip and, starting at the center back, put right sides together and match the edges. 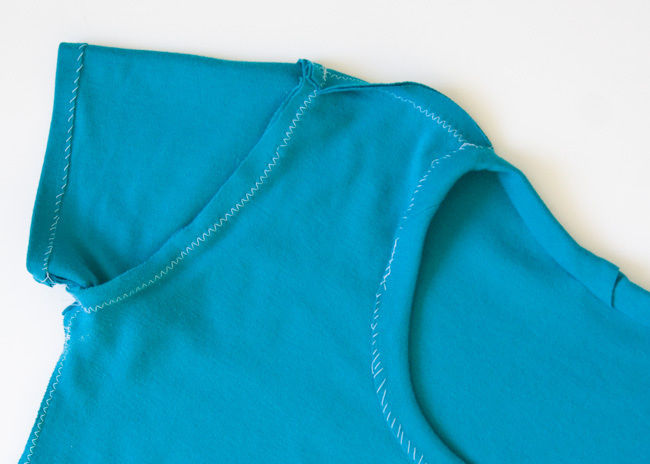 Begin sewing (1/2 inch seam allowance, with your zig zag stitch) while gently stretching the strip (NOT the neckline itself) as you make your way around the neckline. Go all the way around the neckline and trim any excess strip. 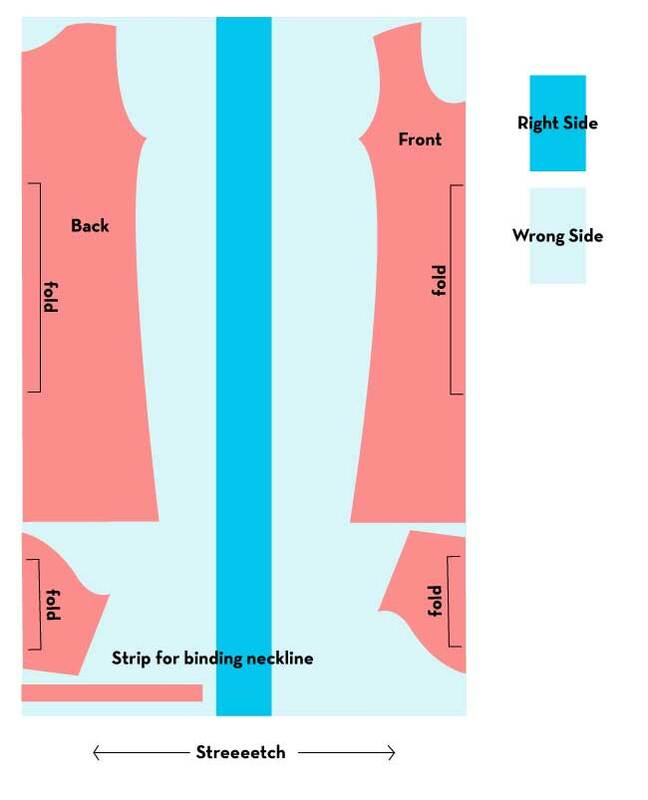 Then press both the strip and the seam allowance UP and away from the body of the dress. 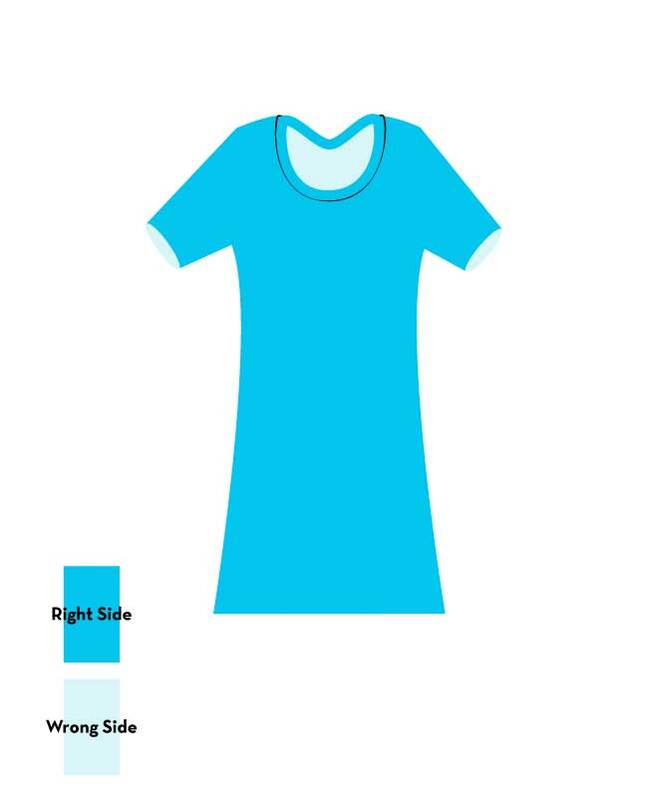 Then, fold the strip toward the inside of the dress and over the seam allowance, enclosing it. Press into place. But it looks great on the outside! Try it on, make any fit adjustments (I ended up taking it in just a little bit from under my arms to the top of my belly) and you're done! Want to see 6 ways to style a DIY t-shirt dress? 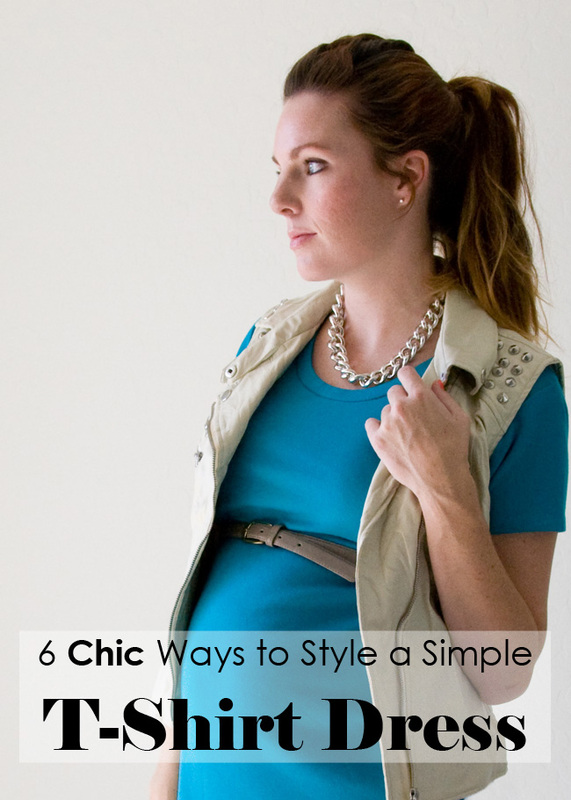 Check out my post over at Babble! I can't help but feel like this post was meant for me!! I've been wanting to make myself a t-shirt dress all summer but haven't really known where to begin! Thanks!! My #SparklerStyle From This Week! A little #SparklerStyle Inspiration for Your 4th!